MATSUYAMA - A pilgrimage route stretching across Shikoku, one of Japan’s four main islands, has recently been attracting more non-Japanese visitors with various cultural and religious backgrounds. The roughly 1,200-kilometer journey, called “Shikoku Henro,” is circular route that encompasses 88 temples associated with Buddhist priest Kukai (774-835), posthumously known as Kobo Daishi, who was born and trained in Shikoku and founded the esoteric Shingon sect of Buddhism in the ninth century. Earlier this month at Ishiteji Temple — No. 51 on the route — in Matsuyama, Ehime Prefecture, foreign visitors were walking the pilgrimage route in pouring rain, wearing the customary white costumes and conical sedge hats worn by pilgrims. Albert Kirch, 56, from Basel, Switzerland, was taking a break on a bench with his friend Mikio Nakaoka, an employee of a trading company in Osaka who is in his 60s. The two met on the pilgrimage and have been continuing their journey together ever since. 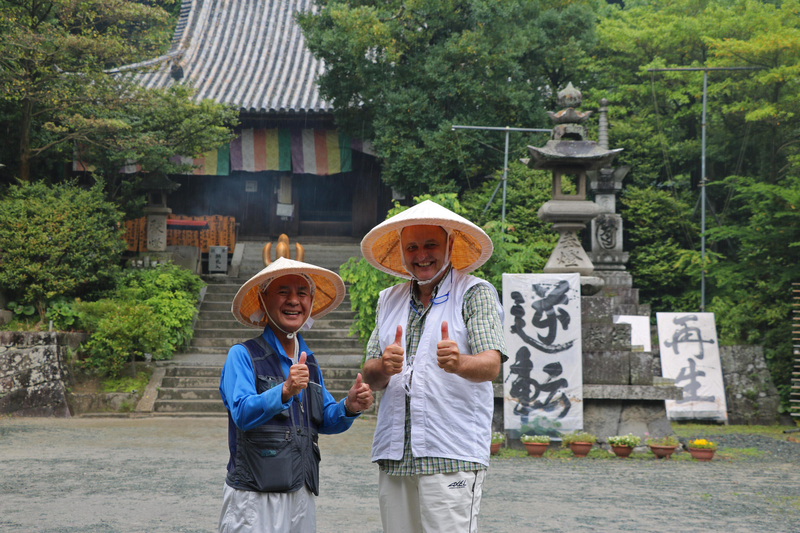 “I just like pilgrimages in general,” Kirch says, explaining why he was taking part in the Shikoku Henro. He had previously completed other routes overseas, including the Camino de Santiago in Spain, a pilgrimage that attracts hundreds of thousands of people each year. “Shikoku Henro is physically harder, but I’m enjoying the beautiful landscape and nature here,” he said. “I’ve lost more than 10 kilograms on this pilgrimage,” he says, smiling. Kirch and Nakaoka walk about 25 to 30 kilometers per day and plan to complete the whole course by May 22 or 23. Although there are those who complete the trek — which can take about six weeks — by walking 30 km per day, others are simply satisfied with exploring some of the sites as tourists. At each of the 88 temples, pilgrims typically recite sutras or pray silently, and can get their pilgrimage book stamped and signed. Max Kornek, a 25-year-old Dutch student studying film at a university in Tokyo, was visiting the temple with his father Peter, 67, and mother Maria, 63, both from Amsterdam. “We wanted to see Japanese culture in the countryside instead of an urban setting and interact with people,” Kornek explained of his reason for joining his parents on the pilgrimage. 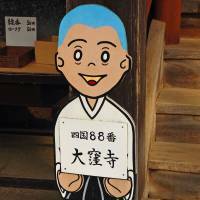 It was the second time for his mother to make the Shikoku Henro. She was aiming to complete the whole route on the third leg, as she likes to conduct a pilgrimage in stages. “It’s really emotional,” she says. “I have questions in my life, and I keep asking those questions to Kobo Daishi during the pilgrimage,” she said, referring to the concept of dogyo ninin, in which a pilgrim is accompanied and guided by Kukai along the way. Professor Hiroshi Terauchi, head of Ehime University’s Research Center for the Shikoku Henro and Pilgrimages of the World, has studied the recent rise in foreign pilgrims visiting Shikoku, pointing out that many of them are interested in premodern Japan. “Many foreign visitors conduct the Shikoku pilgrimage in search of encounters with ‘lost Japan,’ hoping to see the countryside as well as to make interactions with locals,” he says, adding that the tradition of osettai (hospitality and support by locals) is one of the distinctive characteristics of Shikoku Henro compared with pilgrimages overseas. “Here in Shikoku, there remains traditional Japanese culture that cannot be seen in big cities,” said Terauchi. 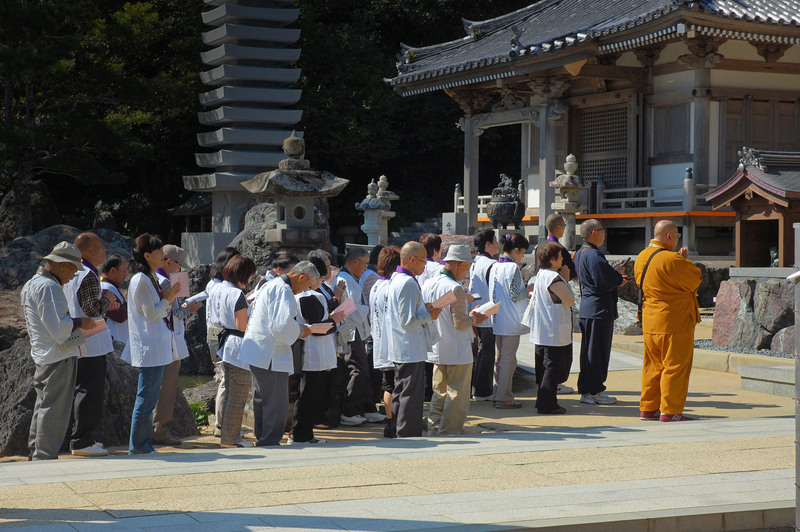 Based on his observations and research, David Moreton, a Canadian associate professor at Tokushima University’s Institute of Liberal Arts and Sciences, argues that, by joining in the Shikoku pilgrimage, foreign pilgrims gain a sense of belonging to a privileged group. Moreton says the number of foreign visitors who left their names on a list at a Kagawa Prefecture facility along the route was 74 between April 2006 and March 2007, 160 in the same period between 2013 and 2014 and 404 in the same period between 2014 and 2015, indicating that the number of foreign pilgrims is increasing. The number of overnight stays by foreign visitors in Shikoku is also on the rise, about 280,000 in 2014, up from about 220,000 in 2013, according to data from the Shikoku District Transport Bureau. Overall, hundreds of thousands of people are said to engage in the pilgrimage annually. Some travel solely on foot, but many also use automobiles, bicycles or other means — Terauchi says 80 to 90 percent of pilgrims use buses or cars these days. 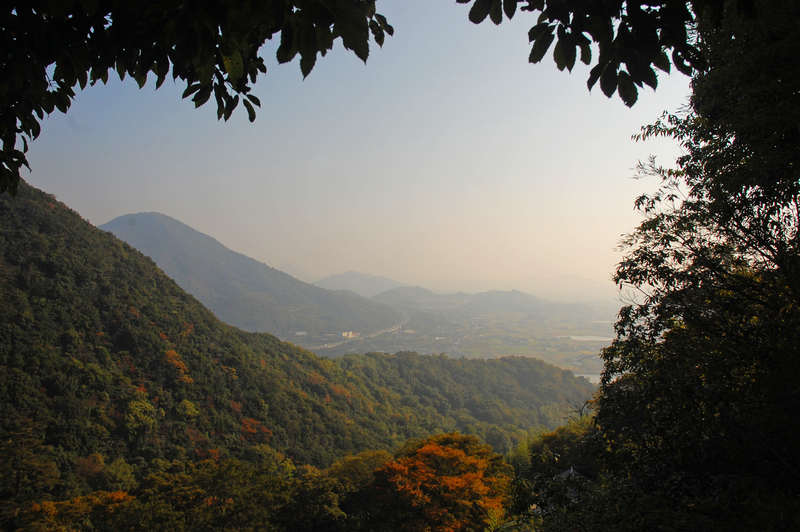 Terauchi expects the number of visitors to grow considering the recent selection of the Shikoku Henro as one of the seven major tourist routes in the country by the Japan Tourism Agency and because it has been named as one of the “Japan Heritage” sites by the Cultural Affairs Agency. Also, the prefectural governments in Shikoku are making efforts toward getting Shikoku Henro listed as a UNESCO World Heritage site. If the route becomes a world heritage site, it would attract more visitors but some people have expressed concerns that it would lose some of its sacredness and turn into just another tourist site. Shunsho Kato, the head priest of Ishiteji, said it may water down the spirituality of the pilgrimage but at the same time he admitted the necessity of promotion to ensure the route is recognized globally. 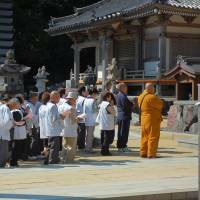 This mix of spirituality and tourism is nothing new, according to Terauchi. He feels it is pointless to categorize the pilgrimage as either a religious activity or a tourist activity. “There are people who come here with religious purposes but also people with other reasons. In the Edo Period (1603-1868), it was already like that, if you read a diary of a person who went around the Shikoku pilgrimage route,” he says. “And there is merit in being listed as a World Heritage site for sure — namely worldwide recognition,” he said, adding that issues still need to be resolved as the route is promoted. The present form of the pilgrimage, consisting of 88 temples, is believed to have been established around the late 16th and 17th centuries, but how and why these 88 were selected from numerous sites remains a mystery, according to Terauchi. 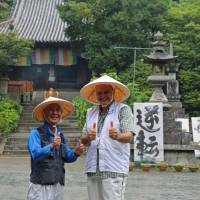 Getting there: The Shikoku Henro route traditionally starts and ends at Ryozenji Temple, Tokushima Prefecture. Pilgrims then pass through Kochi, Ehime and Kagawa prefectures as they tick off each of the 88 temples along the 1,200-kilometer route. But don’t stop at No. 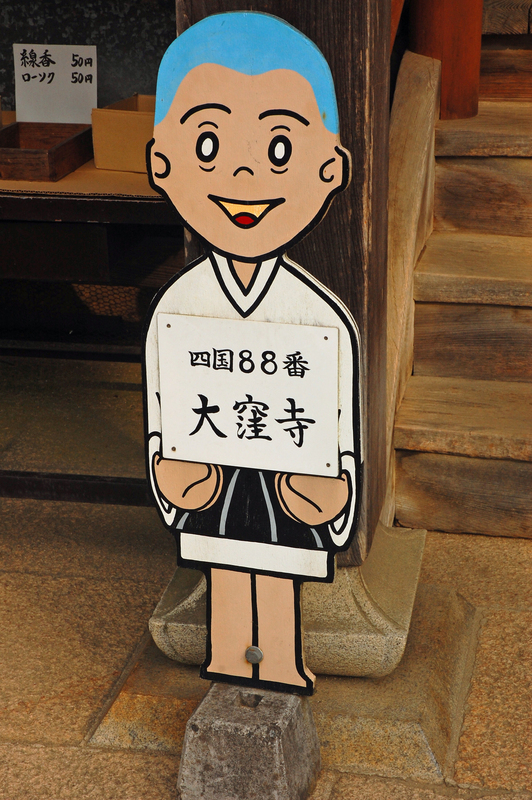 88 — to really complete the pilgrimage, you’ll need to head back to Ryozenji. Although it’s not necessary, the route is ideally travelled clockwise as all signs are positioned with this in mind. 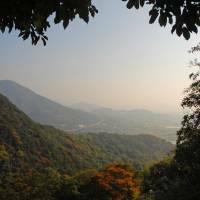 Ryozenji is a 25-minute train ride from the city of Tokushima, which can be accessed by bus from Kobe, by train from Takamatsu, or by plane from Tokyo. For more information on the pilgrimage, visit www.tourismshikoku.org/henro.